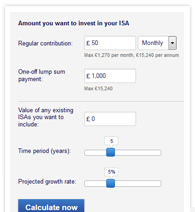 What could your ISA be worth in the future? Including Junior ISAs. See the impact of inflation on the real value and growth rate of your savings over time. Work out whether your estate may be subject to inheritance tax if you were to die today. Calculate the boost tax relief could give to your pension contributions. Calculate what level of income withdrawals might be sustainable, and when you run out of money. Should you delay taking your annuity or will you miss out on income? How much could you contribute to your pension this tax year? 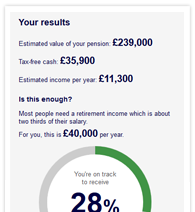 Calculate how much more income tax you will pay if you take a lump sum from your pension. much you may need in your pension pot.